Bruce Springsteen, U2, Beyonce - the stars are lining up for President-elect Barack Obama in more ways than one. Two days before taking the oath of office as the 44th president of the United States, Mr. Obama joined a sea of people in a rousing, star-studded celebration staged before the Lincoln Monument. Bruce Springsteen kicked off the We Are One event with with a mighty version of The Rising. 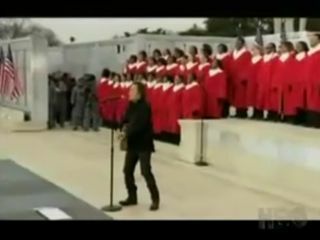 Dressed in black and backed by a gospel choir, Springsteen performed his powerful 9/11 composition - sentiments of which now echo a new feeling of hope. Later, The Boss was joined by legendary, 89-year-old folk singer Pete Seeger for a stirring rendition of This Land Is Your Land, the video of which you can see below. If ever a song was tailor-made for the inauguration of the first African-American president of the United States, it's U2's classic Pride (In The Name Of Love). Check out this video of U2 soundchecking the night before the big show. You can tell it's cold outside! After a day that included performances by The Boss, U2, Bon Jovi, Mary J. Blige, Sheryl Crow, will.i.am, John Mellencamp and many others, what do you do for a finale? You bring on Beyonce, of course, for this heart-quaking reading of America The Beautiful. Enjoy!